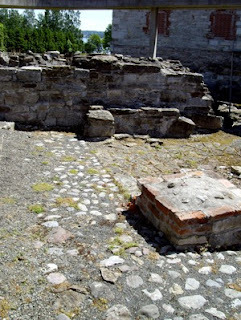 Close to the old cathedral you find the remains of the fortress for the bishops of Hamar. The diocese was founded in 1167, and the bishop’s residence grew in size during the next centuries. Today much of the fortress is still standing and you get a good impression of how large the buildings were. 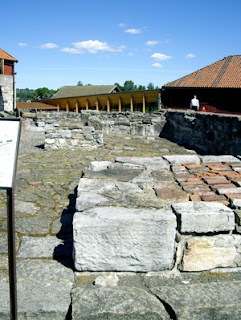 Through the Middle Ages Hamar grew into an important political and religious centre. The church played a major role in this process, but during the 15th and 16th century, Hamar's ambitions of power were challenged by Oslo. The Danish-Norwegian king Christian III embraced the Lutheran reformation in 1536 and as the last Catholic Bishop fled in 1537 the diocese was abolished and this started the decline of Hamar. From 1540 to 1560 century on the Bishops palace and the cathedral slowly fell into disrepair, and it all ended as the Swedes destroyed most of it in 1567. In 1587 the king closed the market in Hamar and the city lost its privileges. 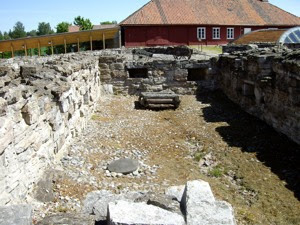 Still, surprisingly enough, much of the remains of the fortress survived and it continued to serve as part of the farm buildings at Storhamar. 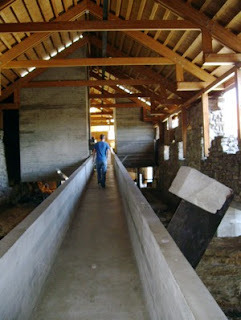 The large barn is built on much of the remains of the old fortress and the Norwegian architect Sverre Fehn designed a new museum building over the rest of the walls. 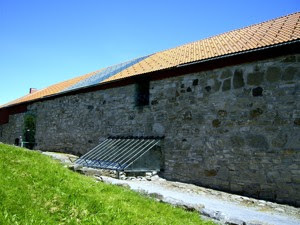 The barn and the new addition are now an important part of the collections of the Hedmark county museum. Here you see the impressive barn that once was the northern wall of the bishop’s palace. Its new role as a farm building at Storhamar farm saved much of it from further decay. It is now connected to the building designed by Fehn. As you enter you see remains of the buildings located within the walls. The keep was the main tower of the fortress. Here you found the bishops quarters. It was a large structure that was built up successively from 1200 until 1450. The tower rose 60 feet over the ground and dominated the whole structure. It also contained the kitchen and probably a large hall on the top. Today only the basement area is left. Here the bishop stored food and a well supplied the bishops household with water. Within the walls you also find the bakery. This small two-room building is much newer, built in bricks and wood in the 16th century, i.e. just before the finale decline of the fortress. One of the rooms had a large fireplace in the corner, and this is the place the guards could get some heat during the cold winter months. The other room had a large oven, where the guards could make the bread for the episcopal household. Another interesting part of the old structure is the kitchen - a vital centre in a strong political centre, also added in the 16th century. Here there were large flat stones in the middle of the room, for an open fire, as well as a fire place in the corner to fry fish or meat. 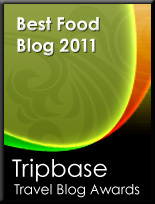 One may just wonder what has been made here to feed the hungry bishop and his men. On the opposite side of the courtyard you would have found the large hall, where the bishop met important visitors. The rooms under the hall was used for storage. 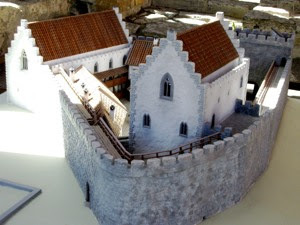 The keep and the great hall are rivalled only by similar buildings in Trondheim (Bishops Palace), Bergen (Håkonshallen), Tønsberg (Tønsberghus castle) and Oslo (Akershus castle). The bishop’s fortress is one of the most important remains in the interior part of Eastern Norway. 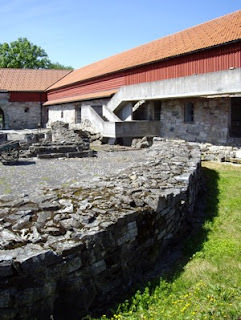 It is a place you have to visit if you travel by Hamar, and you can get a guided tour at the premises. 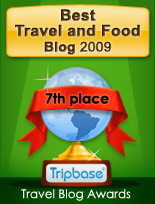 It is evident that you are on historic ground, when you visit the area.